In August 1940, nearly 100 British bombers attacked Berlin, with Tempelhof Airport as their designated target. The nighttime raid caused little damage, with the planes scattering their bombs all over the German capital. More raids followed, with no more impact on their stated targets. But they had a profound effect on Germany’s Supreme Leader, who ordered new air defense measures. On land, stout “flak towers” went up in Berlin, Hamburg and Vienna, with impenetrable reinforced-concrete walls and an effectively endless supply of ammunition behind them. The German Navy had already begun to convert useless hulked warships into similar floating batteries for harbor defense, and now accelerated the program. Seven ships in all would be converted: two old German light cruisers, one captured Dutch light cruiser, two captured Dutch coast defense ships and two captured Norwegian coast defense ships. None held any military value as active warships, and had been used as floating barracks or storage hulks if they had been used at all. The ancient German light cruiser Arcona began conversion work in May 1940. She had been stricken in 1930 and disarmed, serving as a barracks ship at several German naval bases before ending up at Swinemünde. She was converted there, with four 105mm anti-aircraft guns installed along with two 40mm Bofors guns and six 20mm light guns; as with all German warships the number of light guns varied throughout her time in service. Arcona’s engines had been disabled years before, and she had to be towed into position. She served at Swinemünde and Wilhelmshaven, where she was scuttled at the end of the war in shallow water. The hulk was broken up a few years after the war. Her sister Medusa underwent a similar conversion at Wilhelmshaven in July 1940. Like Arcona, she did not have working engines and had to be towed into place. She had the same armament, and met the same fate as her sister. The ancient Norwegian coast defense ships Harald Haarfagre and Tordenskjöld had been captured intact at the Norwegian naval base at Horten in April 1940. The Norwegians had used them as training ships for years; Tordenskjöld had never returned to full operational status after a 1933 breech explosion in one of her main turrets killed four naval cadets. By the mid 1930’s both ships had lost their heavy guns, which had been re-deployed in coast-defense batteries and Harald Haarfagre had become a floating ammunition warehouse. They were in no condition to be used against the German invaders, and neither did the Germans see much use for them as combatants. Inspectors certified both ships as capable of moving under their own power, though very slowly. They were formally inducted as German warships in February 1941 and moved from Horten to the Deutsche Werke shipyard in Kiel for conversion to anti-aircraft ships, completing in March 1941. As rebuilt, they retained their old coal-burning triple-expansion engines, making at most 14 knots. Their old turrets and remaining armament were stripped away, and they now each sported six 105mm anti-aircraft guns, two 40mm Bofors guns and fourteen 20mm light anti-aircraft guns. Now re-named Nymphe and Thetis, they spend a few months defending Kiel before returning to Norwegian waters. They spent the rest of the year stationed in Norwegian ports, and in early 1942 joined the battleship Tirpitz in northern Norway. For the next two years they accompanied Germany’s lone battleship as she served mostly as a target for British air attacks. After British air strikes sank Tirpitz in November 1944, Nymphe returned to Kiel while Thetis remained in northern Norway. Both survived the war and were returned to the Royal Norwegian Navy, which removed the anti-aircraft guns for use in coastal defenses and scrapped the hulls. The Dutch coast defense ship Hertog Hendrik had been taken out of service in early 1940, and captured intact by the invading Germans in May 1940. A British air attack sank the hulk a month later, and in October the Germans raised the wreck with the intention of rebuilding her as an anti-aircraft ship. A captured ship already discarded by its previous owner had very low priority. Work began at Antwerp in 1941, where damage from the air attack was repaired to allow the ship to be moved. The repairs proceeded slowly and the hulk was eventually towed to Kiel, where Deutsche Werke took over the conversion to an anti-aircraft ship. The re-named Ariadne had a heavier armament then any of the other anti-aircraft ships, with eight 105mm anti-aircraft guns, five 40mm Bofors anti-aircraft guns and sixteen 20mm light anti-aircraft guns. Unlike the older anti-aircraft ships, she also had a Würzburg fire-control radar suite. The engines remained aboard; some sources rate the ships as still capable of 16 knots but others insist the engines were only operated to supply electrical power. Ariadne did not complete her conversion until August 1944. She served in the German Bight near Helgoland, engaging Allied bombers headed for Germany, before moving to Danzig in the war’s last weeks. She was returned to the Dutch after the war, who in turn rebuilt her as a barracks ship and kept her in service until 1968. The Dutch coast-defense ship Jacob van Heemskerck was still in service when the Germans attacked the Netherlands. Her crew scuttled the ship, and she was raised by the Germans in the fall of 1940 and towed to Antwerp for repairs. As with the similar Hertog Hendrik, she went to Kiel in March 1941 when she had become seaworthy enough for the journey and commenced a long, slow conversion into an anti-aircraft ship. Now re-named Undine, she emerged as a sister ship to Ariadne, with the same armament and electronics. Completed in August 1943, she first defended the missile-testing site at Peenemunde before moving to Stettin in the autumn of 1944. Like Ariadne, she survived the war and was returned to the Netherlands afterwards, to be converted into a barracks ship. She lasted in that role until 1975. The Dutch cruiser Gelderland had been decommissioned, disarmed and laid up in the naval base at Den Helder in August 1939. The Germans found her still in that state and moved her to Deutsche Werke along with the two coast-defense ships for conversion into an anti-aircraft ship. Work proceeded on this ship, re-named Niobe in German service, just as slowly as on the others and she finally emerged from the yard on 1 March 1944. Niobe carried eight 105mm anti-aircraft guns, and 24 20mm light anti-aircraft guns. She could make 16 knots, and three months after her commissioning she was dispatched to Finland to assist in defending the port of Kotka, then under heavy Soviet air attack. The Soviets had become obsessed with finding and sinking the last Finnish armored coast-defense ship, Väinämöinen, and recon pilots mistook Niobe for the Finnish ship. Waves of Soviet planes assaulted Niobe, which put up a heavy curtain of flak in her own defense. She shot down nine of the attackers before succumbing to nine bomb and torpedo hits. She sank in shallow water, and after the war the Royal Netherlands Navy refused to take possession of the wreck, leaving the Finns to raise and scrap her. Full-sized Second World War at Sea playing pieces for all seven anti-aircraft ships are included in our Ships of Plan Z background book. A few have appeared in Second World War at Sea games before on smaller pieces (Thetis and Nymphe see a little action in Arctic Convoy, protecting Tirpitz). These pieces simply give you larger and more attractive ones than what we’ve used before. They’re not really necessary for play of the games, but if you’re a hard-core naval gamer, they’re really necessary. 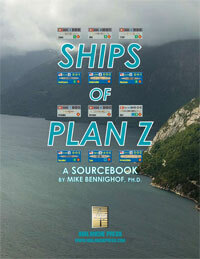 Click here to order Ships of Plan Z right now!